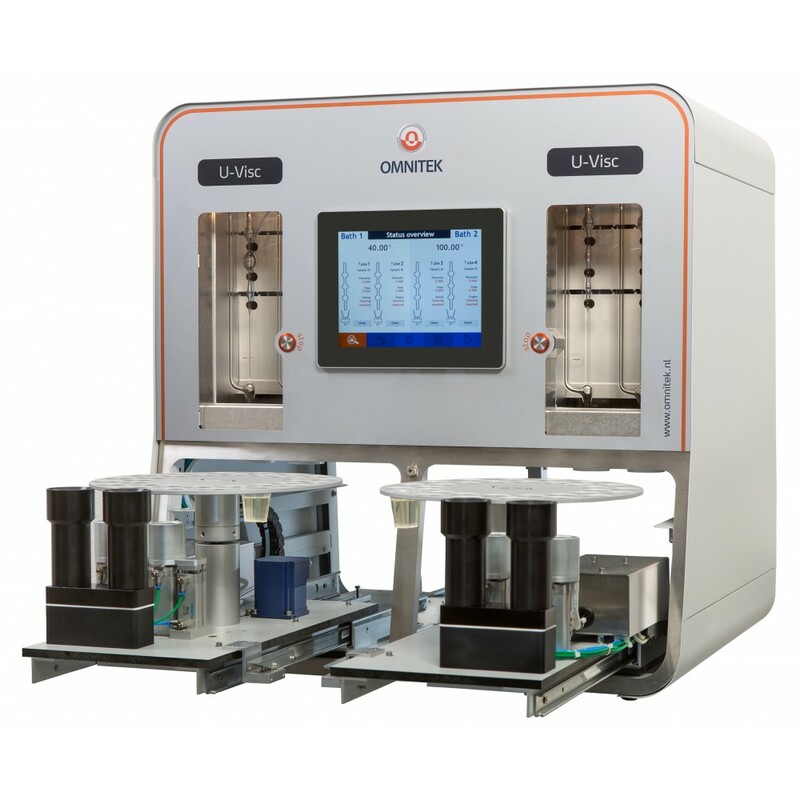 Omnitek U-Visc Automatic Viscometry System – Koehler Instrument Company, Inc. 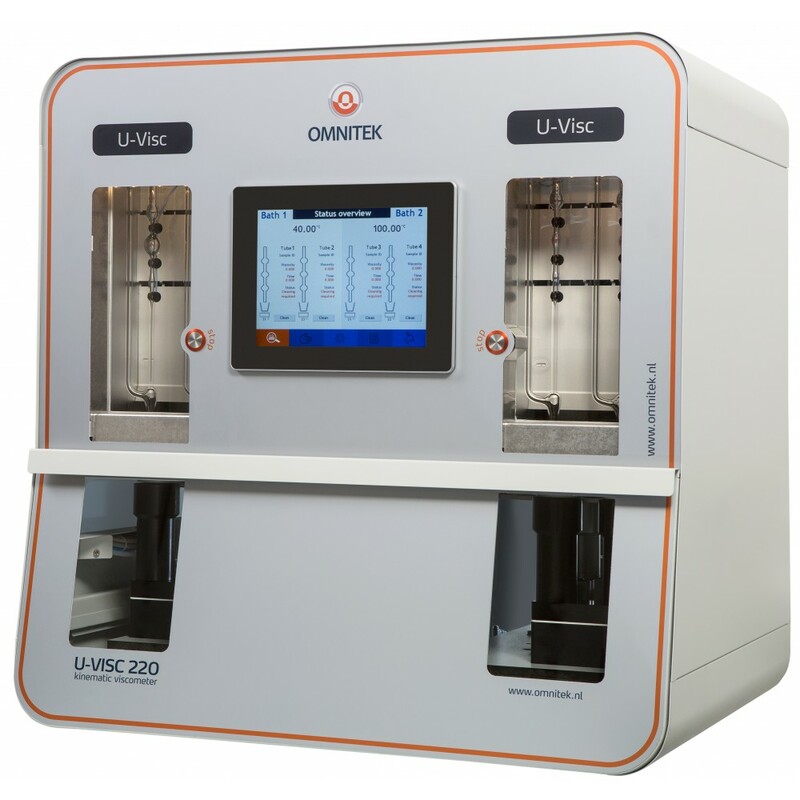 The Omnitek U-Visc is the next generation of completely automatic viscometry systems. The system combines several unique features, making it the instrument of choice in many applications, ranging from QC to R&D to used oil analysis. While offering full compliance with ASTM D445/D446, the specially designed viscometer tubes cover a 100-fold range, e.g. from 1 to 100 mm2/s. The tubes are based on the well-known and proven Ubbelohde design, but only require 8-16 mL of sample and approx. 12-15 mL of solvent for cleaning. Available with single or dual solvent cleaning, the instrument measures kinematic viscosity in Newtonian fluids like lubricants, fuels, or dissolved plastics between 0.15 and 25,000 mm2/s. Designed to be versatile and flexible, yet easy to use. Different models are available from 1 bath with 1 or 2 viscometer tubes, up to 2 baths with 1 or 2 viscometer tubes per bath, where each bath works independently. Sophisticated temperature control ensures that measurements are carried out well within limits specified by ASTM D445. Each bath features a 32-position sampling tray (16 samples per tube, allowing completely unattended operation. Depending on the viscosity of the sample, the instrument can process up to 40 measurements per hour, satisfying even the needs of high volume labs running several hundred samples per day. Samples can be introduced using vacuum or pressure. The latter avoids evaporation of sample, which can be a point of concern in some dilute viscosity applications. Viscometers are easily exchanged in minutes instead of hours, minimizing downtime. All surfaced of the viscometer tubes, including the outside bottom, which is in contact with the sample, are thoroughly cleaned and dried using solvents and air. 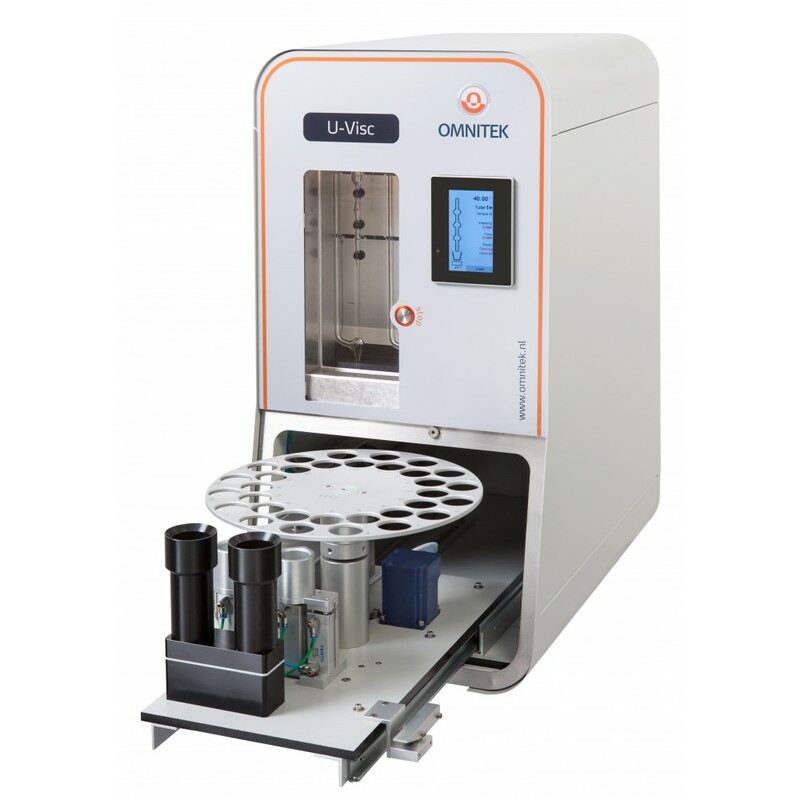 Omnitek U-Visc requires a PC for operation (not included) but can also be controlled as a stand-alone unit through the responsive color touchscreen interface with a storage up to 10,000 measurement results. For full data collection, storage, calculations, and reporting, an advanced PC software application is provided with the instrument, which can gather data from multiple instruments simultaneously. While using the software during a run, several kinds of information is shown like measured flow times, average, spread and calibration / viscosity result. Also, actual status like filling, cleaning, etc. is shown for every unit involved. Measured flow times are presented in left or right column, depending whether the upper or lower measuring bulb is used for testing. Sample queue is permanently present and can be edited any time without interrupting running samples.